ii. Only Australia with 198 medals and England with 136 were ahead. India's 26 Golds was also third, behind Australia (80) and England (45). India's combined 66 medals is its third-best showing in the history of the Games. iii. India's best remains 101 in New Delhi (2010), followed by 69 in Manchester (2002). iv. India's best Gold tally of 38 came at home in 2010.
v. India's maximum medals came from shooting (16), followed by wrestling (12) and weightlifting (9). i. 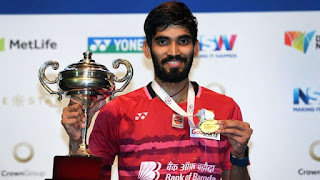 World number one Indian shuttler Kidambi Srikanth won his career's first Commonwealth Games singles Silver medal. ii. In the final, the 25-year-old Indian lost to Malaysia's Lee Chong Wei, who won his career's third Commonwealth Games singles gold medal. Notably, only three Indian shuttlers have won CWG men's singles title– Prakash Padukone (1978), Syed Modi (1982) and Parupalli Kashyap (2014). i. Shuttler Saina Nehwal defeated world number three PV Sindhu in the first-ever all-Indian women's singles final at the Commonwealth Games. ii. With this, Nehwal claimed her second Commonwealth Games singles gold medal after having won it at the 2010 Delhi Games. Nehwal is the only Indian female badminton player to win singles gold in Commonwealth Games history. i. In line with the efforts to indigenize the defence sector under the 'Make in India' initiative, Larsen & Toubro (L&T) and Bharat Electronics Limited (BEL) signed an MoU to cater to the needs of evolving domestic and export markets for defence products and systems. ii. The MoU seeks to leverage the capabilities of both the firms for meeting the growing requirements of the Indian Armed Forces. The MoU also intends to leverage the well-developed supply chain, vast experience and expertise of BEL and L&T to synergise and enhance exports in the defence sector. i. The National Skill Development Corporation (NSDC) signed an MoU with the Nuclear Power Corporation of India Limited (NPCIL) to provide skill training to 500 youth and women at Kudankulam in Tamil Nadu. ii. The skill development project will be executed by NSDC through its approved training partners near Kudankulam Nuclear Power Project (KKNPP), the single largest nuclear power station in India, situated in the Tirunelveli district of the southern Indian state of Tamil Nadu. i. State-run Punjab National Bank (PNB) launched new products such as pre-approved credit card and UPI solution to mark its 124th foundation day. ii. Besides, the bank announced its UPI partnership with the expense management app WALNUT that comes embedded with features such as bill reminders, bill-split and instant paperless loans. · PNB Chairman- Sunil Mehta, Headquarters- New Delhi. · Incorporated under the Act VI of 1882, Indian Companies Act, PNB commenced operations on April 12, 1895, from Lahore.